A gaping ideological divide cuts through this year's gathering of world leaders at the United Nations. It's not between capitalists and communists, rich and poor, East and West. It's between multilateralists who advocate nations working together and unilateralists who are pushing for national sovereignty. Despite near-universal hand-wringing about the U.N.'s failings, it was clear who was in the minority on Tuesday. United Nations Secretary General Antonio Guterres speaks during the United Nations General Assembly, Sept. 25, 2018 at U.N. headquarters. 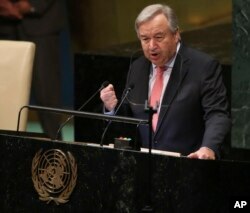 Guterres, who heads the 193-member U.N., warned of the dangers of nations turning inward in a speech that was the inverse of Trump's. “In the face of massive, existential threats to people and planet ... there is no way forward but collective, common-sense action for the common good,” he said. Although it was Trump's chance to speak to the world, he appeared to play to a domestic audience and struck a triumphalist tone. “We will never surrender America's sovereignty to an unelected, unaccountable, global bureaucracy,” he said. 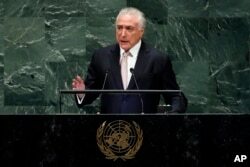 Brazil's President Michel Temer addresses the 73rd session of the United Nations General Assembly, at U.N. headquarters, Sept. 25, 2018. 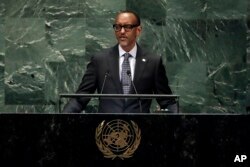 Rwanda's President Paul Kagame addresses the 73rd session of the United Nations General Assembly, at U.N. headquarters, Sept. 25, 2018. Turkey's President Recep Tayyip Erdogan addresses the 73rd session of the United Nations General Assembly, at U.N. headquarters, Sept. 25, 2018. 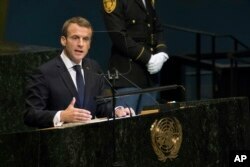 French President Emmanuel Macron addresses the 73rd session of the United Nations General Assembly, Sept. 25, 2018 at U.N. headquarters. Macron noted there has been increasing skepticism toward the U.N., European Union and other international bodies. He said that ``you may be tired of multilateralism,'' but urged against complacency and isolationism. Seychelles President Danny Faure addresses the 73rd session of the United Nations General Assembly, at U.N. headquarters, Sept. 25, 2018. Iranian President Hassan Rouhani addresses the 73rd session of the United Nations General Assembly, Sept. 25, 2018 at U.N. headquarters. 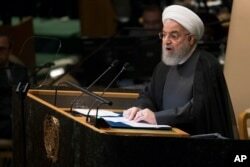 Rouhani’s speech was dominated by Iran's bitter rivalry with the U.S. which under Trump has withdrawn from a 2015 nuclear agreement with world powers that provided sanctions relief to Tehran. The U.S. accuses Iran with supporting terrorists.